I didn’t grow up with Super Mario. My experience of Mario games is for the most part fragmented and third-hand. A friend owned a copy of Super Mario All Stars so I would see the first few stages of each Mario over and over again every time I visited. In high school, when I was getting into emulators, I would load up the same games, play for five minutes sitting stiff-backed at a keyboard, then never play again. In the last couple of years, I played both Super Mario Bros. and Super Mario World to completion on my WiiU and felt like I finally understood why these games were significant beyond the fact that many of my peers played them as a child. And despite my frustration with the narrowness of videogames’ accepted canon (“Oh wow you’ve never played Super Mario World before? ?”), these are important games. They’re elegant, clever, well designed, imaginative. They’re the kind of games that if I played them in the late 80s or early 90s I would have been absolutely captured by their charm and the way they suggest through hidden paths and invisible blocks the existence of countless mysteries to discover. Most crucially is the movement. The “sticky friction” of Mario’s inertia that makes momentum so crucial and movement constantly fluctuating between frustrating and fluid. While other platformers see movement as just the baseline on which ‘real’ interactions are developed, the Mario games understand that movement itself (of fingers, of avatars) forms the base pleasure of videogame play. It’s for this reason alone that Super Mario Maker works as well as it does. Outsourcing level design to players was always going to result in an overwhelmingly number of mediocre levels. But that’s okay, because each and every level give you a new environment to move Mario through and a constantly new environment to explore. Movement and exploration have kept Mario fresh for thirty years now, and Super Mario Maker taps into this. 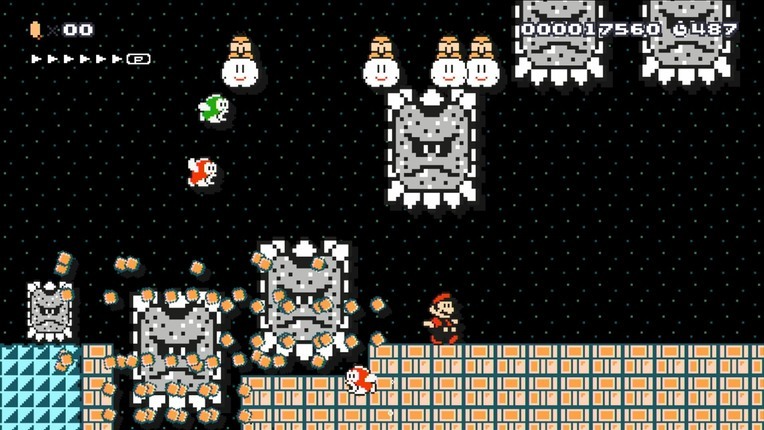 Super Mario Maker lets you make your own Super Mario levels. I was struck by Griffin McElroy’s review at Polygon where he compares the game to a making-of documentary in the way it gives players the pieces and lets them put it together themselves.Truly, the game functions as an interesting historical document. Not just of the Super Mario games, but the roundabout ancestry of Mario Paint and Warioware DIY as well. But this alternative history probably leads to my only real disappointment with the creation tools. Nintendo wants creating courses in Super Mario Maker to be simple and accessible and in no way daunting. It seems to me they don’t want a few people to be making all the levels and most people just playing them; they want people to be making levels as playing and then to have the confidence to share those creations. To this end, the editor is incredibly simple. Almost too simple. More complex items such as a question mark box that gives you a mushroom if you’re small or a fireflower if you are big are absent. There is no real way to string multiple stages together to create worlds. There is no custom music composing tool. You cannot add mid-level checkpoints because, I assume, the added complexity to level testing. None of this bothers me too greatly as I understand and applaud the desire for accessibility. Yet, at the same time, Warioware DIY (and what I have seen of Mario Paint) provided incredibly robust tools including a music editor and even object-orientated programming while still being accessible. 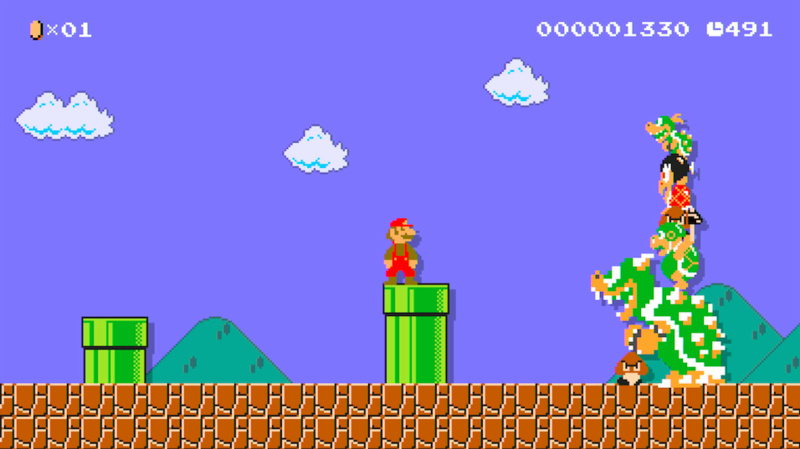 Compared to these unofficial predecessors, then, Super Mario Maker can feel a bit simple, almost patronising. But then, again, I don’t think complex is what Super Mario Maker was going for. Some reviews have complained about the general quality of player-created levels, that most of them are rough, poorly designed messes that don’t capture the spirit of the original game. I think rough messes is what Super Mario Maker wants people to make. It feels like it wants people to doodle and then to show those doodles with the world. I find myself admiring this. I sat down with a friend’s four-year-old daughter and within ten minutes she had completed her first level. I find myself excited at the general mediocrity of most of the levels I play. They feel like irreverent and blasphemous collages. The spirit of the original Super Mario Bros is its elegance and clarity. The spirit of Super Mario Maker is scribbling with a fat crayon all over that elegance. It’s satisfying in an (entirely commodified and not-really-at-all) subversive way. For thirty years we’ve been playing these games and now we get to spray graffiti all over them. It’s cathartic, almost. Super Mario Maker encourages you to make the best levels you can, rather than good levels. And it encourages you to share those levels with others. The slow drip-feed of content in the course creator forces you to spend days with only a few objects unlocked before you get more interesting objects and enemies to place. To unlock more stuff, you gotta get creating. It’s a nice parallel of actually being creative: to be able to do stuff you gotta do stuff; you have to be bad at something before you are good at something. The simplicity of its editor (which, in part, includes what it does not allow you to do) encourages players to get creating and uploading immediately, which is crucial to both the game’s longevity and the player’s experience. Because of this simplicity, no Super Mario Maker course will ever really feel like the ‘actual’ games. You might try to make Super Mario Bros’s 1-1 but now that second mushroom/flower box will always be one of those or the other. The coins are no longer building you towards a one-up as the counter will reset after the level. You are not thinking as you near the end of the level how crucial it is to stay big so you can smash your way to the top of 1-2 to get to the warp gates. In short: there is no progression or continuation. Each course stands on its own. This has the interesting effect of rendering previously extrinsic motivators into intrinsic motivators. Points don’t matter (though they never really did). Coins don’t matter. Unless you are doing the 100 Mario Challenge, 1-Ups don’t matter. Yet, I find myself hunting all these things out. Not because they are going to help me later on but because it is satisfying to do so. To go through the motions. (However, I find I no longer bother to grab more than one coin out of a coin box now. Why bother?). So in a paradoxical way, the reasons why Super Mario Maker will never produce the spirit of the original game are also how its numerous disposable levels allow a distillation of the core pleasures of those games (namely: movement and discovery). The 100 Mario Challenge both reinstates some permanency and continuation to stages and also amplifies the sense of messiness and disposability. You have 100 lives to finish 16 random levels curated in terms of difficulty (that is, the ratio of attempts to actual completions by other players). At any point a stage can be skipped and replaced with another stage. Getting through the 100 Mario Challenge is less about dexterity and more (I apologise for this) knowing when to hold them and knowing when to fold them. But mostly the 100 Mario Challenge just functions as a ‘shuffle’ button. It’s the equivalent of not knowing what you want to listen to so you tell your music library to just shuffle all songs. You find a few nuggets of gold, more than a few thoughtless attempts to fill a screen with enemies, but mostly just entirely mediocre-but-competent areas to run and jump through. It’s effortless exploration of an un-curated community and that gives it a real energy. It is where I spend most of my time in Super Mario Maker, besides actually making course. It is easy to find something to play in Super Mario Maker and then play it. It is near impossible to actually build and foster any sort of personal community of creators or curatorship of courses. The functionality of Course World, the online pseudo-social media component of the game is worse than useless. It in no way integrates with your existing friend list on your WiiU, instead requiring you to manually follow both strangers and friends. But you can’t search for users; instead, you need the archaic 16-digit code for one of their stages to find that course and then find them through that course. Once you follow people, they are added to an obscure list that is only ever sorted by the order in which you followed people. You receive no updates when someone you follow uploads a new level; they are not bumped to the top of the list. The only option is to manually check every single user in your ‘Following’ list to see if they have added anything new. Further, you can not check who is following you, so building reciprocal relationships is impossible. Curating courses is no better. You can star courses that you play, but stars are also required for players to eventually be able to upload more than 10 stages. Unless a course is terrible, it is thus polite to star everyone (and unfair to those without external social media networks if you do not). Nintendo’s own curated listed are not great, but this would not be a problem if the social network features were better integrated. Inevitably, the same users and the same course types always float to the top of these lists and then stay there. The lack of any sort of tagging system means finding any particular sort of level is next to impossible. In short, the whole system is useless, and the only explanation is its designer has not used a social media website this side of the invention of the telephone. The greatest risk to the game’s longevity (except perhaps the non-popularity of the WiiU console) is the terrible design of Course World. Eventually, you get sick of just listening to all your music shuffled. Something needs to be said about player labour. These kind of games that effectively ask the player to create the game’s content are always critiqued for the way they distribute labour (but never wealth). Instead of paying for a game, you end up paying for the right to produce that game’s content. In many ways, you can see games like Super Mario Maker as extensions of the same mentality of companies like Uber and AirBnB. Uber has no cars, Air BnB has no properties, Super Mario Maker has no courses. Usually I don’t fully agree with such critiques. Most of them start with talking about the labour of modders (most of whose work remains the property of the game’s creator) and then move on to user-creator games like LittleBigPlanet. But I’m not sure I find the two analogous as the ‘work’ of creating a Super Mario Maker level is also playing Super Mario Maker. I think some weird sort of conflating happens here between play and labour (~*playbour*~) but not the good kind that acknowledges that play is a form of labour (or that ‘playfulness’ is often used to obscure labour). More of a bad kind that seems to suggest if your play/labour is producing something then you need financial recuperation. I don’t know. I’m not a Marxism theorist. My point in bringing it up, however, is that in Super Mario Maker the sense that I am working for Nintendo in producing these levels feels more explicit and pronounced than in, say, LittleBigPlanet or Trials: Revolution. Through the way assets are drip-fed to the player and the way the number of courses you can upload is determined by the popularity of your existing courses, it feels less like I am sharing my own levels for fun and more like I am just providing Nintendo with content for their game. It’s entirely due to the presentation of the game and the inability to produce my own sort of personal community within the Course World. I am just another labourer ensuring the 100 Mario Challenge will always have fresh courses. But perhaps this is intentional. Perhaps Super Mario Maker wants you to feel like a ‘real designer’ on the game with all the constrictions that entails. Indeed, after you complete a 100 Mario Challenge the credits share a list of ‘level designers’: each user whose courses you played. This would also function as an extension of Warioware DIY, where the player is essentially Wario’s game designer lackey pumping out games so Wario can get rich off the player’s labour. For two weeks I played Super Mario Maker exclusively on the WiiU tablet’s screen. I had just finished two weeks of dominating the television for Metal Gear Solid V and was feeling pretty guilty about this. But then I decided to play some levels on the television screen instead of the tablet screen, and the difference was tangible. It looked not just bigger, but more vibrant and, weirdly, more subversive. Most Super Mario Maker courses are crap. Most of anything is crap. This in itself is not a problem. I think Nintendo should be applauded for making Super Mario Maker not just accessible but reassuring. It gives you not just the tools to ‘just make something’ but the confidence to then share it. That most of its levels are not well designed is neither a fault of the players nor of the creation tools. The problem is the inability to foster any sort of personal curation or community so that each player can find the kind of levels and creators they want to engage with while ignoring the chaff. But that the vast majority of Super Mario Makers are creating and sharing less-than-perfect levels can only be considered as a success for the game. This entry was posted in Notes and tagged Notes, super mario maker by brendankeogh. Bookmark the permalink.